The Pakistan cricket Board on Saturday evening rewarded the best players in the country in a ceremony that took place at a local hotel. 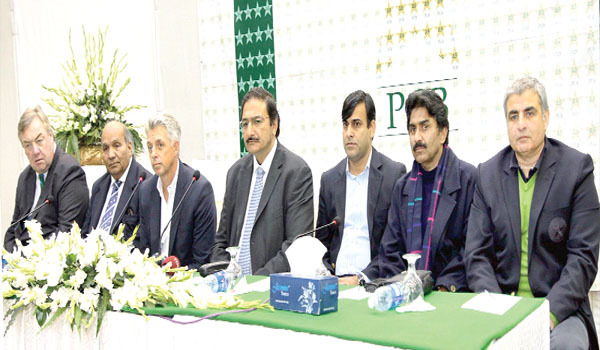 ICC CEO, Dave Richardson, was the chief guest of the function and appreciated PCB’s initiative to conduct the Pakistan Super league (PSL), which is a five-team Twenty20 tournament starting in March this year. “Pakistan needs to regain the confidence of the international cricketing world & the PSL is a sensible step in the right direction,” Richardson said on the occasion. Richardson hoped international cricket returns to Pakistan soon as 30 international players are expected to be part of the PSL. “I’ve visited Pakistan on a number of occasions & I’ve always enjoyed visiting a country that is cricket mad,” he said. Chairman PCB announced cash award of Rs 500,000 each for all players (ODI and T-20) who visited India. An additional prize of Rs 500,000 each was announced for top 5 performers (Junaid Khan, Nasir Jamshed, Saed Ajmal, Muhammad Hafeez and M. Irfan). Rs 250,000 was announced for the each member of the Team Management. Muhammad Shakil Wins PCB Deaf Cricketer of the Year 2012 at the PCB First Annual Awards. Saeed Ajmal won PCB T 20 International Bowler of the Year award at the PCB First Annual Awards in Lahore. Saeed Ajmal accepted his Trophy from Khurram Hussain – Bank AlFalah. Ajmal said upon receiving the Award:“I must thank the PCB. More than personal recognition ahead of such a super bunch that I share the dressing room with, I admire the PCB’s starting the National Awards”. Nasir Jamshed Wins PCB T 20 (Int) Batsman of the Year at the PCB First Annual Awards in Lahore. Nasir Jamshed accepted his Trophy from Mushtaq Muhammad. Nasir said upon receiving the Award: “Personally this is a very special moment! 2012 has been a good year for us all round as Team Pakistan. Hopefully we shall do even better in 2013”. Ahsan Raza who was named the PCB Umpire of the Year 2012, accepted his Trophy from Mr. Haroon Lorgat. Zulfiqar Babar was named the Most Valuable Domestic Bowler. Upon receiving the Trophy from Imtiaz Ahmad, he said: “To include Domestic Cricket categories in its first National Awards indicates that the PCB is now giving far greater importance and recognition to domestic cricket than in the past. I am very glad to be named the Most Valuable Domestic Bowler. It will be an incentive for me to work even harder to raise myself one step above at the international level”. He dedicated his award to his parents. Muhammad Jamil was PCB Blind Cricketer of the Year 2012. Jamil accepted his Trophy from Blind Cricket Association chairman. Sana Mir was PCB Women Cricketer of the Year 2012. Sadiq Muhammad presented the trophy to Sana. She said: “Personally I am overwhelmed and overjoyed! Woman cricket in Pakistan is already moving upwardly and the reason is the full support of PCB and its chairman, especially in training and coaching facilities. And above all it has provided us the opportunity of continuous international experience which has brought rapid development. Now after the initiation of this Award and inclusion of Women Cricketers is an another very encouraging step”. Junaid Khan, Emerging Player of the Year was presented with the trophy by Muhammad Zaka Ashraf. Junaid said: “This is the most exciting moment of my life… to be named the PCB Emerging Player of the Year when so many young and upcoming stars are making a name for themselves is something that I would always cherish and value”. Haji Muhammad Bashir, Curator of the Year 2012 said: “The ground, the pitch and the outfield, are such an important part of cricket. Through this Award the PCB has for the first time given us importance and honour that was our due. I wish our grounds will see international cricket very soon”. Earlier, Dave Richardson and other ICC officials visited the National Cricket Academy where they were briefed about the developments in Pakistan cricket and PCB various plans with regards to promotion and management of the game in the country. Dave said that the ICC is always with the PCB and will support it in the holding of international cricket. He also termed the Pakistan Super League a positive step forward in the revival of international cricket in Pakistan.